Yesterday Brigid passed on to us some chocolates made by a woman she met by chance at the copy center. They struck up a conversation and later a little package of chocolates was handed over. It turns out the woman, Sandra, is just setting up her shop, Baseema Chocolate. 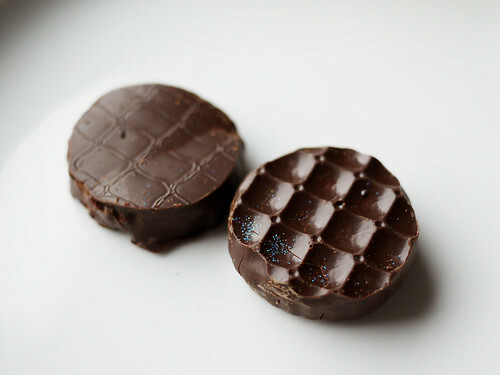 I hope she succeeds because who wouldn't want chocolates thoughtfully dusted with blue glitter? Looks absolutely delicious! I would love to try one (or 10)! Lol!